Introduction. This is the second of two pieces on the ‘tobacco endgame’. In the first, (Are we in the endgame for smoking?) I presented some data on global cigarette use to show that we are not in an endgame, at least in an endgame defined as “the late or final stages of any activity”. This is important because if policy-makers believe cigarette use is shortly to disappear, there is a danger they will be indifferent to or impatient with policies designed to mitigate the harm caused by ongoing use. 2.2 Is the objective legitimate? Tobacco free generation: it is made illegal to sell or supply tobacco to people born after a particular year (2000 is usually cited, though that is likely to change as 2018 approaches) [article]. The BMA supports this idea. Sinking lid: this is ‘cap and trade‘ applied to tobacco supply. Government defines a maximum quota of tobacco or tobacco products that can be sold in a given jurisdiction each year (the lid) and this amount is decreased annually (the sinking lid). Quota can be allocated or auctioned and traded between companies [article]. 5.1. Marketing and distribution role of tobacco suppliers transfer to a state-controlled monopoly: this would have a mandate to service the existing market, but shape it to minimise harm. 5.2. Non-profit enterprise with public health mandate’ (NPE): this would remove profit-making from the entire tobacco supply system and replace duty to shareholders with a responsibility to meet the public health goal of phasing out smoking. 5.3. Performance-based regulations (PBRs): imposes legal requirements on tobacco companies to reduce the number of people who smoke their products and to impose effective financial penalties on those who fail to do so. 5.4. Price regulation: a regulatory agency would impose price controls at the manufacturers’ level, reducing the financial returns to suppliers to “correct the market failure, resulting from an oligopolistic cigarette market and to reduce the market power of tobacco manufacturers”. Note: all these measures are in fact ‘supply side’. The idea of these eight endgame proposals is that they will bring about the end of… well, what exactly? We need to start with a definition. (1) What is the thing that will end if these proposals succeed? Are the endgamers discussing the end of tobacco use, smoking, tobacco-related disease, nicotine use, the tobacco industry or what? Clarity on this matters a great deal. If, for example it is possible to reduce smoking but it would mean sustaining or increasing nicotine use then different approaches are possible and desirable – essentially substituting harmful forms for relatively benign forms of nicotine delivery (i.e. carrying risks comparable with other consumer products or lifestyle choices). If the tobacco industry is the target, then futures in which they play a changed role are ruled out. (2) What constitutes ‘an end’? Is it literally zero consumption, or some notional low level that is deemed close enough to zero to class the problem as an insignificant public health threat – such as smoking prevalence below 5%, adolescent tobacco use below 1% – or what? One desirable end state might be everyone being at ease with their nicotine habit (just as I am at ease with my caffeine habit). This would mean the number of people who say they want to quit their chosen form of nicotine use is very low – the end of cognitive dissonance. At present it is common to find a majority of smokers declaring a wish to quit (e.g. among American smokers ~70% – though these figures do not reflect the degree of commitment and willingness to forego perceived benefits or to endure loss). Forcing the end of smoking or tobacco isn’t self-evidently the right thing for a government to do. It cannot simply be assumed that there are no smokers who value smoking, tobacco or nicotine use more than they value the health gain they get by stopping. They may even value it more than public health authorities value their health. What if the loss, craving or withdrawal have significant welfare detriments for some? Making people quit who value smoking or are unwilling to tolerate withdrawal and cravings could easily reduce total welfare and do harm. The proposals need harder testing against of people’s actual preferences. 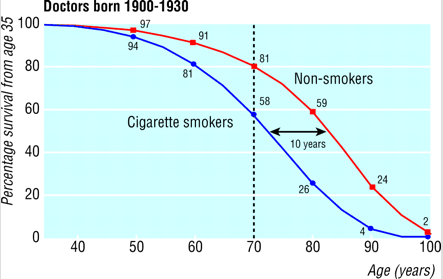 And maybe longevity isn’t a singular overriding goal, and perhaps some smokers don’t care that much if the median smoker’s life is shortened by ten years from age 83 to 73, (see Doll et al 50 year doctors survey and graphic showing smokers’ shifted life expectancy curve. Also, see Carl V. Phillips on the absurdity of having a unitary goal of maximising longevity). What if people don’t care until they are over 40 and then their priority is to have an alternative or an exit route? What about the people with mental illness for which smoking has a therapeutic value? Means may not justify the ends. What if you would be content if the end of smoking happened, but, like me, you are concerned about the way it happens? Perhaps you wouldn’t want to force it on people – because freedom from state harassment is also a valued goal along with better health? People do many things we might disapprove of or choose not to do personally, but that doesn’t create a justification for eradicating them by force. Welfare focus? In my view, ‘welfare maximisation’ is a better objective than ‘smoking minimisation’ or any of the other objectives – and welfare maximisation is generally what governments try to do. Of course health is an important component of welfare. But smoking minimisation or health maximisation cannot be assumed identical to welfare maximisation. Even if many people quitting smoking or nicotine experience improved welfare, that may not be universal, and especially if it is done coercively. Welfare maximisation is not straightforward as people’s view of their welfare-maximising options may change over time and nicotine is dependence forming, but it might be that harm reduction options available to the smokers when they want them will allow for genuine welfare maximising pathways through nicotine use. None of these proposals foresee smoking becoming obsolete through producer innovation, consumer preference or the accumulated effect of the existing body of tobacco policies. They all involve new and intrusive forms of state intervention. However, the proposal sponsors do little to question the purpose and limits of state intervention. This is their primary weakness: acceptability. The secondary weakness is feasibility. 2.3.1 Enabling or coercive state? Case for intervention: what is the justification for the state intervention envisaged in the endgame proposals? Harm to the individual? Harm to others? Harm to the state? Why should preferences of legislators over-ride individual preferences? Proportionality: are the proposed restrictive measure proportionate? We have a threshold of tolerance and risk appetite that does not close down all risk either to the individual or to others. Consistency: are the proposals consistent with how, as a society, we treat other risky activities? We celebrate some highly risky consensual activities and tolerate many others. Is the tobacco situation exceptional in some way? Wider impacts: do the proposals have other, undesirable, consequences that should be offset against the intended purpose? Your view of what government is for is fundamental: is it an ‘enabling state’ that assists people in making their own choices with information and support, or is it a ‘coercive state’ that uses the law to force people to change in way that they hope will deliver outcomes that the state has determined? These concepts should be central to any discussion of the endgame, and indeed any other aggressive tactics imposed by the state, such as the use of fear or shame campaigns (see, for example discussion in Ethical considerations on the use of fear in public health campaigns). The question is not only whether they work, but whether they reflect an appropriate relationship between citizen and state – a point not even considered, for example, in this recent study on the use of shame in anti-smoking campaigns. There is no objectively correct answer to choices discussed above. These are political choices – value judgements about the type of government and society you favour. Supporters of clerical theocracies like Saudi Arabia or oppressive autocracies like Russia may have one view (often the view of one group imposed on others by force), while supporters of liberal democracies have another and there is a spectrum between. These political choices are, however, often codified in constitutional statements like the US Constitution, EU Treaties, a body of case law principles, international conventions and so on. Do the endgamers see these broad principles of law as obstacles to overcome or principles to work within? Proponents of the endgame need to become more aware of, and articulate about, their underlying political philosophy. The supplement did contain two papers that touched on these issues (Thomas BP, Gostin LO. Tobacco endgame strategies: challenges in ethics and law here and Kozlowski, Ending versus controlling versus employing addiction in the tobacco-caused disease endgame: moral psychological perspectives here). These authors did at least consider these issues, but most of those making endgame proposals appeared simply to see the ends as a self-evident justification of the means, without giving these issues any attention. The reason to start with a discussion of the scope and limits of state action is that the endgame proposals have common themes that test the limits of state power in a modern democracy. Two themes stand out: prohibitions (sinking lid, tobacco-free generation, nicotine reduction and sales ban) and appropriation of property (the supply side measures). Supporters of endgame ideas with a prohibitionist orientation need to be explicit that they believe it is acceptable for the state to regulate personal risk behaviours to the extent of preventing adults doing something they wish to do with a reasonable knowledge of the risks involved – i.e. a prohibition. That is quite unusual in liberal democracies and opens the question as to whether this would be applied consistently to other notable risk behaviours, such as horse riding, mountaineering, playing squash in middle age etc. We are, mercifully, seeing a lifting of prohibitions on some illicit drugs after years of experience has shown them to be ineffective and actively harmful: would the tobacco endgamers oppose these liberalising moves on principle? The practicalities of prohibitions are discussed below. …nor shall private property be taken for public use without just compensation. Endgamers need better justifications for how they would operate within these principles, or why and how they would override them. This is not a completely hopeless cause. All companies face regulation that changes their market value all the time, and they face a degree of political or regulatory risk as a result. The question is how do you show the benefits of the endgame ideas can be justified as a reasonable and proportionate abrogation of property rights? None of the supply side proposals attempt this. I think that many in the tobacco control field simply regard the tobacco industry as fair game: nothing is too abusive for them. But if you are trying to make serious policy, you have to recognise they are legally-constituted corporations acting in a legal market, regulated and taxed by governments. You cannot illegally appropriate the property of their owners any more than you can legitimately break in to their offices and steal things. Prohibition does not mean zero sales. A prohibition does not mean that the prohibited good is no longer available, it just means it is supplied through a different, usually criminal, supply chain. It is illegal to sell marijuana to under 18s anywhere in the US, but in 2013 use among high school students was 23.4% (used in last 30 days). Tax losses. Prohibition means products are sold without tax, causing rents accrue to the criminal supply chain rather than the state. An unregulated market supervised by criminals. Instead of contract law, product standards, marketing regulation and taxation, the illicit supply chain is regulated by violence and the honour codes of criminals. There is a default ‘buyer beware’ regime for quality and safety with no legal recourse for consumers. Proceeds of crime. Involvement of criminal enterprise has second order effects – for instance in sponsoring other forms of crime or terrorism. There is currently an estimated $320 billion trade in illicit drugs. Criminal suppliers of tobacco may also wish to engage their customers or criminal associates in other forms of criminality – a gateway effect perhaps? Proportionality of punishment. The prohibitionist has a problem with penalties. If the penalties are too light, then they will be ignored and the law will be ineffective and fall into disrepute. If they are too heavy, then they will be disproportionate to the offence. The challenge is to find a regime that is both proportionate and effective. In its efforts to establish a Caliphate the Islamic State has its own endgame smoking prohibition, which appears to carry the penalty of flogging, imprisonment or even execution (see Islamic State: smoking will kill you one way or another, LA Times, for an example of a live smoking prohibition in action). Criminalising users. There are significant harms caused to users by the range of offences in a prohibition – imprisonment and criminal records can blight lives to a greater extent than tobacco use. Law, enforcement and corruption. There is a danger that the law falls into disrepute if it looks disproportionate, and that officials do not enforce measures or take backhanders – prohibitions create a corruptible opportunity. Offsetting behaviour. To the extent that one risk behaviour is closed down by a prohibition, it does not mean that the risk is reduced commensurately. It depends what behaviour is undertaken instead – in the most optimistic scenario this would mean smokers switching to vaping. Forbidden fruit. It is possible that making something illegal increases its value to certain risk-seeking, authority-defying individuals. Some notes on each of the main proposals follows, but should be read in conjunction with general criticisms above. Supply and demand. Note that all of the proposals, not just those identified as ‘supply side’ are supply side proposals. It should be obvious that tensions arising from constraining the supply without addressing demand are a fundamental weakness in the full suite of proposals. There are no answers here to the question: “how do you reduce people’s desire to smoke?” other than “by force”. The key benefit of alternative low-risk forms of nicotine delivery is that they address the demand side – people who wish to take nicotine can do it in a way that is less harmful. This approach involves banning sales of tobacco to people born after a certain date (typically 2000). We should know by now that prohibition of sale to a particular age group does not mean that nothing is sold. It means that the supply chain reconfigures to match demand through intermediaries and illegal sales. There are already extensive bans on selling tobacco to under-18s but still youth tobacco prevalence can be high – for example in the United States, where 22.9% of high school student use tobacco, despite great efforts to reduce it. This proposal extends this ineffective model to adults, who will need to carry age-related ID and be barred from buying tobacco even if they choose to – an infantilisation of adults that most would find absurd and unacceptable. In fact, it will have bizarre borderline effects where in, say, 2030 a person aged 31 would be able to buy tobacco but a 30 year old would be ‘carded’ and not permitted to purchase tobacco. So the proposal combines a proven ineffective measure with patronising approach to adults. This will fall into disrepute rapidly and fails a reductio ad absurdum test. It is possible that a government prone to gestures will agree to do it, but it will be rescinded by the first government that has to deal with its consequences for adults. This approach involves controlling the quantity of tobacco available and reducing it annually. It is largely pointless and would soon fail. The effect can be achieved much more straightforwardly through taxation. There is an extensive literature on the equivalence of fixed quantity trading systems and taxation, with a seminal 1974 paper by Martin Weitzman, Prices vs Quantities, setting the tone. When a quantity (whether sulphur emissions from power stations or tobacco released on to the market) is fixed, then the price will rise to find a market-clearing demand. This price will be the equivalent of applying a tax to the same products to achieve the same level of demand. The full equivalence can be achieved if the government auctions the quotas and keeps the revenue. In theory, the choice between the two instruments depends on how much it matters if you are wrong in setting the quantity or the price. For a fixed quantity trading system, how much does it matter if the price rises far more than you expected? With a tax, you might be worried if it doesn’t cut usage to the extent you hoped? In real-world practice, politicians will want to prevent excessive prices (for the same reason they don’t levy huge taxes) and will try to second guess a quota (or lid) that will do that. It is much more efficient therefore to simply use the price they are content with – using a tax. Tax more realistically addresses the limits of these systems, which is really defined and constrained by acceptable price rises. Predictable? The idea that it creates a predictable future trajectory of tobacco use is extremely optimistic. Commitments to reducing quota made one day may be torn up or adjusted the day after if they look as though they are having undesirable price effects. Policymakers prove adept at inventing mechanisms that adjust quantities – banking, borrowing, backloading, reserves – that can change the quantities in order to stabilise the price. All of this experience exists in environmental emissions trading. Impacts of raising prices. A further problem with both taxes and quantity based systems for a consumer good, which both use price (directly or indirectly) to regulate demand, is that they are vulnerable to black market or cross-border trade, and they may be regressive and punitive, with particular impacts on low-income and mentally ill people who are disproportionately represented among smokers. The additional problem with a quota system is that it adds needless complexity, especially in dealing with international trade, establishing a quota trading exchange, reconciling sales with quota, holding auctions, dealing with entrants etc – and, as discussed above, it doesn’t regulate prices. It is not a way of going beyond taxation as an instrument, it’s an inferior instrument suffering from greater limitations, and all the same constraints. This is a form of graduated prohibition of cigarettes – essentially making cigarettes unviable as recreational nicotine delivery devices by making it impossible to draw nicotine with pharmacokinetics that provide an adequate psychoactive reward. As such it suffers from generic problems of prohibition. There would be hoarding, market-based reactions including higher nicotine cigarettes carrying higher prices, hard-to detect black market activity, cross border activity, DIY nicotine enhancement using e-liquids. There might also be unintended reactions, such as an increase in marijuana use. But the most important problem with this proposal is what it actually involves. It means diluting the active drug in cigarette smoke with higher levels of toxins. There would be more tar and toxic gases in the smoke per unit of nicotine – i.e. it makes the drug delivery system more toxic. The major specific obstacle here is that a responsible regulator would have to show beyond reasonable doubt that their actions were not making the products more dangerous to continuing users. It should also be an ethical imperative in public health not to make dangerous products more dangerous. Compensatory smoking. The further problem with this idea is with ‘compensation’ – a well understood phenomenon in which smokers adjust their smoking behaviour to maintain a satisfactory dose of nicotine, a process know as ‘titration’. This happens via a range of techniques, but typically taking more puffs per cigarette or deeper puffs. The problem is that if a regulator reduces the concentration of nicotine in the tobacco, then they may increase the amount of leaf (consumed in the form of smoke) that it is necessary to consume to achieve a given nicotine dose. That has the effect of increasing toxic exposure. Note that the ‘compensation’ does not have to be complete – if there is any partial compensation at all (i.e. nicotine exposure does not fall in line with reducing concentration in the tobacco), then the toxic exposure will increase. They do not mimic what would happen in a realistic regulatory ramp-down at whole population level, where there will be long lags as cigarettes in the supply chain or hoarded by smokers work through the system, and the supply system cannot adjust overnight. The proponents need to set out the nicotine reduction trajectory they envisage to be practical and desirable, and then design experiments to test that. These studies are quite short term and may be showing temporary adjustment effects as smokers adjust to higher toxin exposures or different taste effects. They haven’t looked at what would happen over a period of 24 months – the bare minimum duration of a feasible transition to sub-addictive cigarettes I would estimate. The studies do not have the power to assess whether certain types of smoker or even individuals exhibit compensation and raised toxin exposure. The regulator has responsibilities to all smokers, and cannot work with averages alone. A re-analysis of one of the studies suggests that a subset of more dependent subjects may experience compensation. It concludes: “a short time to first cigarette is associated with an increased compensatory response after switching to reduced nicotine cigarettes”. (Note: time to first cigarette after waking is one measure of dependency). The drop outs in these studies are an important group – some may be walking away because they can’t face the reduced nicotine products. In the trial they can go back to smoking their normal cigarettes, but in the prohibitionist policy implementation they cannot do this. There may also be non-compliance – i.e. smoking regular cigarettes while unobserved. They have yet to test particular populations who might plausibly be at greater risk, for example: those more heavily dependent; people with mental illnesses who may derive therapeutic value from nicotine; light smokers who could more easily intensify their smoking behaviour without hitting aversive smoke exposures; different races or genetic profiles, with different absorption rates of nicotine. They have yet to provide a convincing explanatory theory, given the observed pervasiveness of compensation in population measurements [see here], as to why nicotine titration and compensatory effects would not emerge in the case of reduced nicotine cigarettes. If they developed this theory, they could design experiments specifically to test it and how applicable it is in the smoker population. The Bandiera et al reanalysis of the Benowitz et al study (both include Neal Benowitz as author) generated the following graphs describing blood cotinine – an indicator of nicotine uptake – as the nicotine concentration decreased over the duration of the study. The U-shaped curves suggest either or both of: (1) significant compensation after a period of learning and adjustment to higher smoke concentration; (2) non-compliance – i.e. subjects were smoking regular cigarettes rather than the reduced nicotine cigarettes required by the trial. At least to me, these findings do not inspire any confidence that the risk of compensation or increased toxic exposure arising from reducing nicotine has been empirically challenged. Time will tell if and when mandatory nicotine reduction in tobacco cigarettes will occur and what impact it might have on smoking prevalence. The question posed here is “Why wait?” Resources used in implementing a reduction in nicotine content have an opportunity cost. In the meantime, nicotine-maintaining harm reduction strategies can have nearer term effects on tobacco use as an individual and a public health issue. Alternative approach. If they did want to make cigarettes unviable (and there are many reasons to doubt the wisdom of that) then a better approach for a regulator, given the typical regulatory mandate described above, would be to set standards for reducing the exposure to toxins delivered with the active drug nicotine. This can also be regarded as a form of stealth prohibition if it becomes impossible to design compliant products. It is not clear to me whether the authors see switching to snus, e-cigarettes, heat-not-burn tobacco as part of this strategy. It doesn’t sound like it from the statement above, and this is not discussed in their paper. Lowering the nicotine in cigarettes would tend to relatively strengthen the alternatives by weakening the cigarette value proposition to smokers. That is a viable strategy, but I would prefer to rely on improvement in the alternatives rather than degrade the nicotine delivery performance of cigarettes in a way that is likely to increase toxic exposures to continuing users and amounts to a prohibition. This proposal has the merit of offering clear political choice, but no other merits. All the problems of prohibition apply along with all the questions about the appropriate role of the state discussed above. Add to this the intention of forced immediate quitting for everyone who uses tobacco and the economic disruption – to government and the supply chain – and the prospects of this ever occurring in a liberal democracy are remote and will result in years of litigation. As discussed above, they are even proving problematic in the brutal Caliphate established by Islamic State. There is no need to spend much time on this. These proposals involve changing the objectives, incentives and institutional arrangements for the supply of tobacco to align these with public health objectives. These all suffer to varying degrees from the problem of appropriation and violation of property rights. Most governments take these problems seriously as they form part of the generic climate for economic development. The proponents of these ideas have tended to suggest outcomes or objectives they wish to pursue, but have not really looked at how these organisations would actually function operationally. A Tobacco Products Authority (TPA) would have a mandate to service the existing market, but shape it to minimise harm. This takes the function of comprehensive regulator a significant step further: it adds the regulatory agency to the supply chain as a monopsony buyer from the tobacco companies and monopoly wholesaler to the retail trade. That should ring alarm bells. How would prices be set? How would supply match demand? What commercial model would this wholesaler have and what commercial objectives would it have? What would be the route of appeal against decisions made by the Tobacco Products Authority? Compared to exerting regulatory authority at arms length, there is no benefit in joining the supply chain and only complexity and legal obstacles in substituting for the market-based pricing and matching of supply and demand. It is hard to think of a good example of a regulator that plays a functional role in a supply chain that it regulates. A further issue relates to the incentives of those working in the TPA. Whatever a government might hope, those working in the TPA will have their own incentives – partly based on job security, pay, perks and so on. By involving the regulator in the supply chain the government establishes a number of perverse incentives and principal-agent problems, for no obvious return. This would remove profit-making from the entire tobacco supply system and replace duty to shareholders with a responsibility to meet the public health goal of phasing out smoking. This takes the first proposal further. Removing profit from the supply chain destroys its asset value – this includes the $550 billion mentioned above, but also numerous merchants, wholesalers and retailers, and a large number of smaller companies. It involves buying out the tobacco companies and replacing them with public interest companies. In the more detailed paper on this, the authors say: “Existing tobacco corporations could be purchased at fair market value from current shareholders, and the purchase could be financed by industry assets and future revenue streams”. Unfortunately, you can’t buy anything additional with a revenue stream, only a profit stream (i.e. a surplus of revenue over operating costs) and it’s not obvious what assets would be sold if these businesses were to continue to operate as going concerns. The ‘fair market value’ is in itself an estimate of the present value of the future profit stream, so the new enterprises would need to keep making profits to pay for the outright purchase of Big Tobacco. The fair market value is whatever people are prepared to pay, and it is generally the case that the value of firms rise on takeover expectations – making this buy out monstrously expensive, and an implausible drain on public funds or a requirement to generate a large ongoing profit stream to fund a buyout. A further problem arises when you try to determine what employees of this enterprise would actually do when they get into work, given their responsibility is to sell tobacco. Try to imagine being a manager in a company like this. Finally, there is the corrupting influence of money on incentives. It is wrong to believe that public sector monopolies act in the public interest, even if that is what they are supposed to do. They will tend to act in their own interests, and the interests of their managers. There is a rich literature on ‘provider interest’. The largest tobacco company of all – the Chinese National Tobacco Corporation – provides a good example of how provider interest in a nationalised industry can be a barrier to government policy-making. It is not a healthy separation of responsibilities when government owns tobacco, casinos, liquor stores etc. There is no point in buying and becoming the tobacco industry, when you could set up a regulator without conflicts of interest to achieve whatever changes you think will bring about the end game. Imposes legal requirements on tobacco companies to reduce the number of people who smoke their products and imposes financial penalties on those who fail to do so. How does a tobacco company actively reduce the number of people who smoke its products, while meeting obligations to its shareholders and competing for market share? What do its employees actually do? The author of the longer exposition of this draws a comparison with mandates for power stations to reduce pollution – but pollution isn’t the thing that a power station sells, and it basically has control over these emissions through its choice of fuel, combustion technology and flue gas scrubbing. Tobacco companies do not control their customer base in the same way. Unlike molecules of sulphur, smokers are autonomous agents influenced by many things, and the trends in smoking are only partially explicable by explicit programmes to support smoking cessation. Something quite like this has been tried with energy companies, in which they are paid to reduce energy consumption among their customers. However, there is a crucial difference: energy companies do this by selling or giving away something else (usually energy efficient equipment, insulation etc) and they can grow their customer base as much as they want at the expense of their competitors. The proponents of this idea applied to tobacco argue that the quotas created by targets could be traded between companies. This then amounts to a variation on the ‘sinking lid’ concept, but with the quantity being the number of users rather than volume of tobacco. Very few governments have been able to predictably reduce the number of users, why should tobacco companies be able to do this? It is legitimate to hold companies accountable for things they control (e.g. quantity sold) but not to things outside their control. The practicalities of targets like this are formidable, given real life smoking behaviour and the transitions in smoking status that people make. The volume of tobacco is at least easily defined and measured, but the smoking status of a customer is more complex: they may be smoking several brands, change their mix, quit and relapse, reduce smoking by vaping etc. Some will say: “who cares if it makes life difficult for Big Tobacco?” The question is whether they are serious about building a working system that efficiently achieves the objective they set for it. One possible outcome is that the companies just pay fines and pass the cost on to consumers. A regulatory agency would impose price controls at the manufacturers’ level, reducing the financial returns to suppliers to “correct the market failure, resulting from an oligopolistic cigarette market and to reduce the market power of tobacco manufacturers“. This type of regulation is usually used where oligopoly means consumers are charged (“gouged”) more than they would be under more competitive conditions. It is not wholly clear to me how reducing prices helps public health. It may be that the tax authorities can take up the slack, but then you are back to a judgement about what tax levels and prices the consumer can bear – with concerns for the regressive impacts on household budgets and rise of a black market constraining the flexibility of tax authorities to keep lifting prices. This proposal suffers from an unclear definition of purpose, and assessment of how the measure would contribute to an endgame. Its possible merit is that it would transfer rents from the tobacco industry to the government, but price controls in Europe at least would clash with the principles of the single market coded into the EU treaties. Objective. To radically reduce serious diseases caused as a byproduct of recreational nicotine use, without compromising welfare, and while respecting individual liberty and an appropriate role for the state. Strategy. Over the long term, the recreational nicotine market will evolve from smoking tobacco to nicotine delivery with dramatically reduced toxic exposure – as vapour, aerosol, smokeless tobacco, heat-not-burn tobacco products, nicotine lozenges etc. The market may be smaller or larger than it is today in terms of total numbers of users – it hardly matters, if the harms are greatly reduced. The market for recreational nicotine will evolve through producer innovation, consumer preferences and intense competition reshaping the $800 billion per year tobacco industry beyond recognition. The private sector will be the prime agent of this transition, in a market shaped by regulation and incentivised by the profit motive. The accumulated pressures from conventional tobacco control measures (MPOWER) to stop smoking will drive users to seek alternatives and create a significant driver of transition, as now – but respecting boundaries between the state and the autonomy and agency of the citizen. The availability of viable alternatives to smoking will greatly increase the responsiveness to pressures and incentives created by tobacco control measures, compared to having complete tobacco and nicotine cessation as the only or preferred option. A light-touch and proportionate consumer-orientated regulatory framework will encourage innovation in and switching to very low risk alternatives to smoking. The public health community would need to change to adopt a responsible approach to risk communication and candour with nicotine users. It would approach the challenge with humility and empathy, and self-awareness about the limits of its intrusiveness in the lives of others. The disruption and subsequent transformation of the tobacco industry into a recreational nicotine industry – with survival and prosperity for companies that adapt and lead transformation and failure and displacement through ‘creative destruction’ of those who do not. At the moment, most of the public health establishment is working to shield the industry from the disruptive pressures. Smoking evolves to an occasional pleasure for those who still retain a liking for it – but at levels unlikely to do much harm. Those who wish to smoke can do so, much as now – they have good low-risk alternatives if and when they want to stop. The public health community focusses it concern on people smoking in the decades after age 40. Beyond harm reduction. To call this ‘harm reduction’ is to belittle it. It is technological progress in the recreational nicotine market solving problems in the way that human ingenuity has done for centuries. It brings about the obsolescence or marginalisation of a harmful and polluting way of using nicotine through emergence and uptake of superior technologies. Before anyone says it… this is not ‘lights’ again. When the tobacco control community embarrassed itself by wrongly assuming a no less harmful product was safer, it cannot put that right by wrongly assuming a much safer product is no less harmful. I believe these ingredients are in place, but the main obstacles to realising this are in the perverse attitudes of public health establishment and regulators trapped by ideology and extreme asymmetric risk-aversion. “the Stone Age didn’t end because we banned stones”. Joe Gitchell, President at the regulatory consultancy Pinney Associates, has provided some general comments and a response to my critique of the proposal 3.3 Reducing nicotine content. Please see his note in PDF form: Comments on The Tobacco Endgame by Clive Bates. Please do read this before my response on this below. His main point is that I have not given due credit to the proponents of this proposal for their emphasis on low risk nicotine based alternatives to smoking – a point I partly accept. I am grateful for the largely supportive comments from Joe. However. I don’t think this amounts to an adequate defence of the proposal. 1. Ducks the main point. Joe has avoided confronting (or mentioning) my major criticism completely, namely that it is a reckless and unethical idea for a regulator to do something that is likely to make cigarettes more dangerous given what we know of nicotine-seeking behaviour, titration etc – at least for some users in some circumstances. The evidence base presented by the proponents for chancing this measure is so far from adequate that the proposal is premature, and in my view should be contingent on showing that no additional harm will be done. I simply don’t think this will ever be possible, and certainly not to a standard that will survive legal scrutiny of the regulator’s duty of care. I even presented a result from a paper co-authored by one of the proponents that observes compensatory smoking behaviour and therefore likely increased toxic exposure. This should be enough to kill this proposal off in my view – along with the multiple challenges of a de facto prohibition and the opportunity costs of pursuing it. 2. Proponents could accept risk of increased harm. There is another approach the proponents could take: to argue that is it acceptable to raise harm in order to reduce addictiveness – I don’t agree with this, but it is an argument that could be made. The proponents currently duck it by trying to show that there will be no increase in harm. They would be on stronger scientific ground, but weaker ethical ground, if they argued that an increase in harm to existing users is actually justified. That justification is not completely impossible if, and only if, there are adequate low risk substitutes to smoking and everyone involved is provided with full information about relative risk. But they need to be explicit that regulating for more harmful, but less addictive cigarettes is something they anticipate and accept as justified – if they actually do think that. Such products and NRT products may provide the support that is at least temporarily needed for some smokers to give up cigarettes entirely and to manage a world in which nicotine use by burning tobacco is less available. “At least temporarily“? This pays homage to the total abstinence objective – it’s as though the authors cannot just accept (or state clearly) that there is a recreational nicotine market that needs products that are much lower risk. This is one reason I believe they need to be clearer about their objective. 4. Degrading the smoking value proposition to drive switch to low-risk nicotine products. He makes the argument that my preferred strategy (the rise of low risk non-combustibles) would be expedited by simultaneously degrading the smoking ‘value proposition’ by making it s less satisfactory nicotine delivery system – and that this might be a unifying idea within public health. He really doesn’t recognise that introducing what amounts to a prohibition into the system will cause many problems, not just contraband. My own view is that the existing package of tobacco control measures is already a substantial degradation of the smoking value proposition – and is already testing the boundaries of acceptable state intervention, without adding a prohibition that would likely cause more harm. 5. Priority is low-risk non-combustible nicotine alternatives. In terms of priorities, we need an enabling regulatory framework for low-risk, high-nicotine non-combustible products well before we need a constraining regulatory framework for high-risk, low-nicotine combustible products – and I doubt we will ever need the latter at all. In other words, for this proposal to have any shred of ethical credibility there needs to be high quality alternatives to smoking that almost all smokers would find to be an acceptable alternative to smoking. This is my priority and even the supporters of the denicotinisation idea should acknowledge the centrality and urgency of getting the low risk non-combustible nicotine market working and regulated correctly. To his credit, he does acknowledge that. Disclosure: Joe Gitchell and I have discussed this proposal before and made a bet on it while he was visiting London in June 2013. The bet: Within 10 years [28 June 2023], the US FDA will have promulgated, implemented, and begun enforcement of nicotine product standard that progressively reduces nicotine content in combustible cigarettes. Update: on 28 July 2017, FDA announced it was launching a public dialogue on reducing nicotine. Clive remains confident. So what happens to tobacco farmers and all the beneficiaries especial in some third world economies. Clive, once again a brilliant raising of the issues. I’m very glad we can finally discuss these issues and the harm reduction heresy is now dissipating, as it should. Nicotine is not going to go away – it is the delivery method that needs attention. As I said in my 2007 LLM thesis on the topic, as the world’s first health treaty, the FCTC bizarrely and sadly regulated everything but the product itself and that is where attention is needed – nicotine policy. I don’t have time right now to say all the things I’d like but just wanted to say well done and as usual a wonderful raising of the issues. I want to pick up on this discussion as I think Clive’s critique is, by far, the most thorough analysis to date of the various tobacco control endgame proposals that have recently been floated. Developing new outside-the-box ideas is a key component in any creative effort. I’ve been involved in such brainstorming throughout my career, and witnessed a lot of effective measures resulting from such thought exercises. Importantly, success came only after analyzing the ideas generated and ultimately discarding at least 90% of them as not viable, not effective, or too great a demand on limited resources. Generating ideas is great; critiquing them is essential. To date there has been only one detailed effort at defending one of the endgame proposals, that being the defense of the nicotine reduction proposal (thank you, Joe Gitchell), but seen in combination with Clive’s response the original critique seems to remain by far the stronger argument. Of course Joe might want to challenge my view on this . . .
Aside from that there have been no responses, no discussion, no alternative views from the endgame protagonists. This silence is despite Clive’s analysis having made its way to all of the main proponents of the ideas in question. As I have played a key role in promoting discussion of ‘price regulation’, which Clive addresses at 3.5.4 of his critique, I will address that proposal. Importantly, it was never meant to be an endgame, merely a matter of looking at ways to counter the oligopolistic pricing power of the cigarette companies. Having allowed the consolidation of an industry that has a near-monopoly on the delivery of a very widely used dependence producing substance, the resulting ability to use pricing power has had significant market distorting effects. None of my ideas over the years on tax policy changes or regulatory interventions have had any takers, but then I have had much experience at generating ideas that seem to pass that initial appraisal of viability and in turn merely generate a basis for humility. But, again, looking at issues of the extraordinary profitability of cigarettes is not an ‘endgame’, merely a matter of considering changing the financial incentive to focus on selling cigarettes so as to encourage a different sort of nicotine market. Clive’s proposed endgame in any event appears to solve the problem for which the price regulation tactic was developed. As to the other endgame topics Clive critiques, I urge their protagonists to speak out. Debate and discussion is incredibly important as policy options are considered. Rather than simply silently concede and abandon the proposals, or ignore the critique and foolishly carry on as if it had not been made, we need intelligent discourse. Tobacco is different to marijuana. You can’t go from smoking a joint every day to smoking one a week. You either smoke the amount required to give you your personal nicotine level (no cravings) or you stop altogether, or switch to ecigs or snus, if that suits you. Smokers cannot be coerced into permanently cutting down their nicotine intake by, for example, reducing the nicotine content of cigarettes. I tried smoking Merit Ultra lights back in 1982 in the USA. I found I was covering up the air holes and taking frequent and deeper drags. I eventually went back to something stronger. Any attempt to cut off or drastically reduce the nicotine supply will result in a criminal black market not seen since the American prohibition. Apologies, I meant to say you can go from smoking cigarettes every day to smoking on just one day a week. Sorry, wrong again. You can’t go from smoking cigarettes every day day to smoking on just one day a week. Seems to me that more allowance needs to be made for those who have good medical reasons for requiring nicotine supplementation. An active nutrient in the diet with multiple prophylactic and treatment functions is there for a purpose. The state should have no role in forcing any particular supplementation method on the individual or removing preferred options. Also, in a zero-evidence climate*, it is not acceptable to remove access to possibly beneficial consumer alkaloids such as anatabine. * Nobody really knows if it is only the nicotine in tobacco that acts against auto-immune disease, or if more potent anti-inflammatories in tobacco such as anatabine are helpful. Nicotine is an anti-inflammatory and has a measurable role, but research into this area is minimal so far. It is worth noting that government does impose supplementation on the population in food and water. Almost all of that is uncontroversial (notwithstanding anti-fluoride mania). But there is a notable exception: the unavoidable aggressive folic acid supplementation — which is to benefit one particular subpopulation, fetuses — masks vitamin B12 deficiency which happens to be concentrated among other identifiable groups (vegans; the elderly). As with tobacco control, there has been very little in the way of serious discussion of the ethics of this other than among people who presume the right to decide on behalf of everyone. Very nice assessment of different strategies. One size does not fit all. However, I would think that a hybrid of different approaches is what we see and likely will define the nicotine delivery market in the future. The move to vaporized nicotine products has been made possible not only through innovation an access, but also by higher cigarette prices, and a better informed public who sees these newer products as a reasonable alternative to smoking cigarettes. Thanks Mike. One of the concerns here is the ‘better informed public’ part of the picture. We are seeing accurate awareness of relative risks of smoking and vaping deteriorating sharply, with surveys showing that that less than half of smokers in the US think that vaping is safer at all (review), let alone at least 95% safer. This results from a sustained and highly unethical propaganda offensive from many elements of the public health community – effectively delaying and derailing the most promising endgame of all. I think the tobacco control people will eventually change. The more thoughtful one already have or were always in the right place to start with. At some point (this year) the recriminations will start about why smokers are being so badly and irresponsibly mislead – then they will recognise that the whole edifice of trust on which their secure employment depends is crumbling. There’s quite a lot of the diehards close to retirement too. I think that is changing too. Many are locked in to a ‘smoking cessation treatment’ paradigm – but I think the reality of testimony from vapers shows it is something quite different. Yes. Remember Banzhaf? Also, the ‘crackpot tolerance level’ appears to be diminishing year by year. They will never achieve a nicotine free world, ever, and the sooner they accept it the better. Tobacco control was originally a grassroots movement, now it’s largely corrupt & has nothing to do with the ordinary people. The vaping movement is true grassroots and will eliminate smoking if left alone.